Useful excerpts from the NBMedical/Medcast Hot Topics in Medicine workshop series. 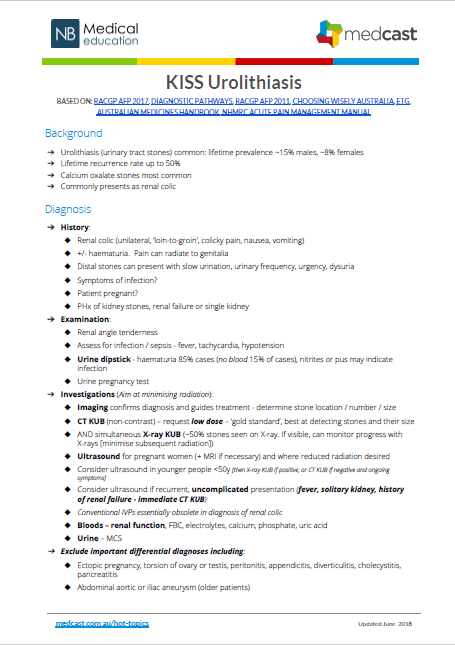 In these Keep it Simple Summary (KISS) updates we discuss Diagnosis, Assessment, Management & Referral of a variety of hot topics. 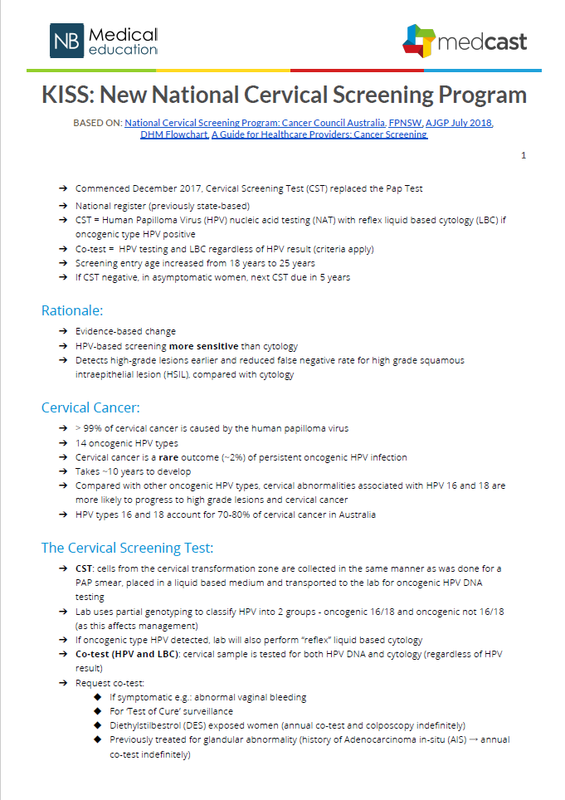 A new national Cervical Screening Program was introduced in Australia in December 2017. This KISS covers all you need to know about the test, target population, interpreting results, the transition to the new program and preventing cervical cancer. Mycoplasma genitalium is an infection caused by Mycoplasma genitalium bacteria. 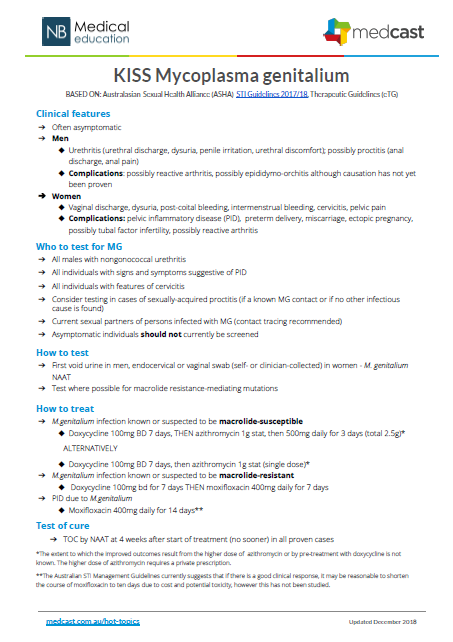 This KISS, based on the recently updated Australasian Sexual Health Alliance (ASHA) Australian STI Management Guidelines, will assist in the diagnosis, testing, and treatment of Mycoplasma genitalium to help minimise resistance in the Australian setting. 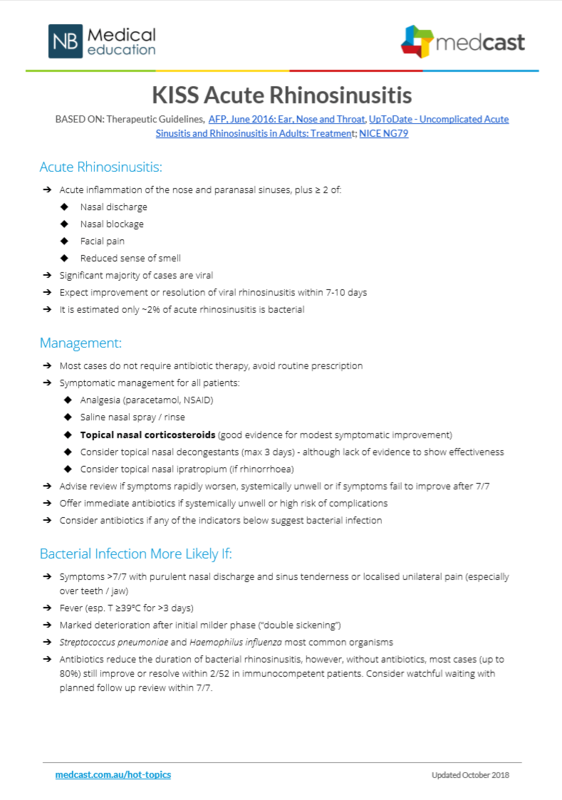 Acute rhinosinusitis is a common primary care presentation. It presents due to mucosal inflammation and reduced mucociliary function of the nose and paranasal sinuses. Antibiotic therapy is common, however, the vast majority of cases are not bacterial. Proton pump inhibitors (PPIs) are commonly prescribed in Australia, frequently for dyspepsia and gastro-oesophageal reflux disease (GORD). 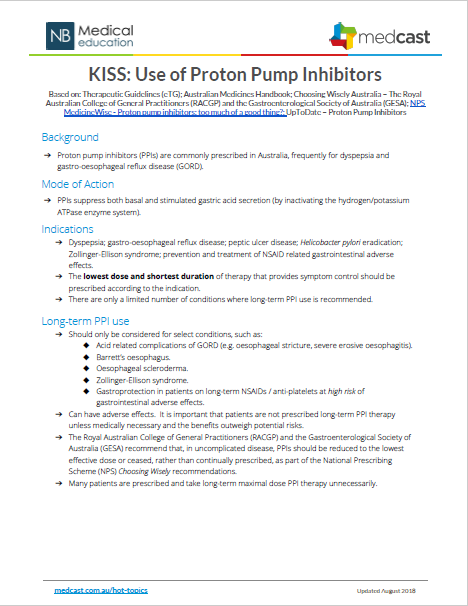 This KISS covers the indications for and long-term use of PPIs. When is reflux not reflux? 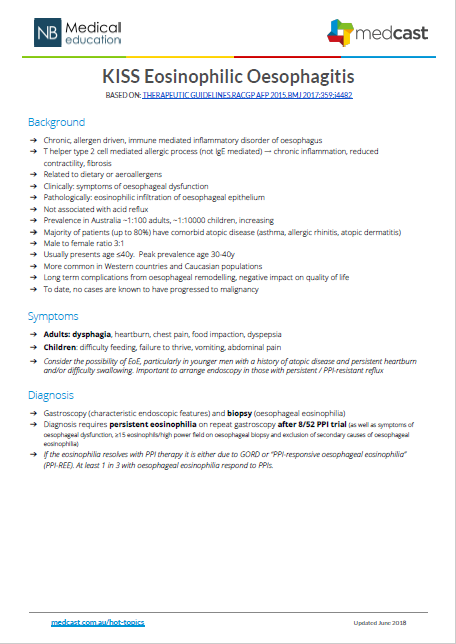 Eosinophilic oesophagitis is a chronic, allergen-driven, immune-mediated disease that was only discovered as a clinical entity around 20 years ago. While it may initially present in a similar way to GORD, the cause and treatment are very different. It is important to consider the possibility of this diagnosis, particularly in patients with a history of allergic disease. This KISS explores the clinical and pathological features of this fascinating condition and discusses the approach to diagnosis and management based on latest evidence. Renal colic and urinary tract stones are common, and most uncomplicated presentations can be managed conservatively in primary care. Importantly, assessment requires exclusion of potentially life-threatening differentials and an awareness of when an emergency department or urology referral is required. 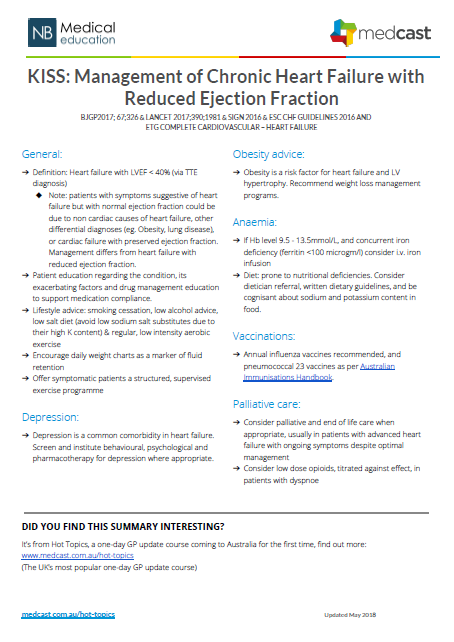 Heart failure is a complex syndrome that affects many Australians. Our management of heart failure has evolved over time as new drugs are developed. In this KISS episode, we discuss the stepwise management of heart failure with reduced ejection fraction and review the place of newer heart failure medications. Do you know someone who suffers from migraines? Or are you yourself afflicted by this common and debilitating condition? 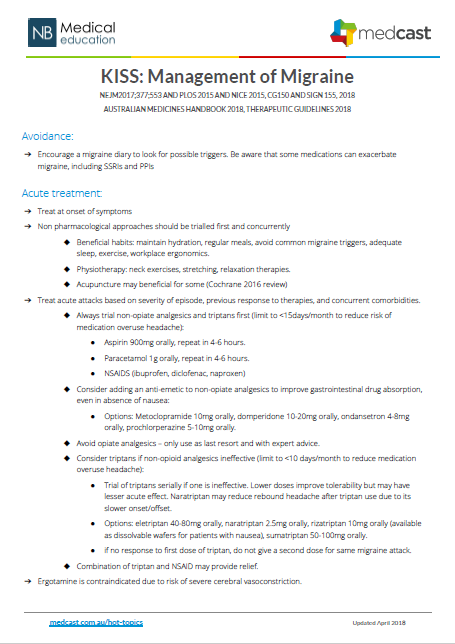 This KISS edition explores how we can successfully reduce the impact of migraines on our patients, through the timely use of pharmacological agents to treat acute attacks and the judicious use of prophylactic medications for selected migraine populations. Peripheral arterial disease is often under-diagnosed and under-treated, yet it is very common and associated with significant cardiovascular morbidity. Early treatment can lead to improved health outcomes, so it is important to be aware of the problem and screen at risk patients accordingly. 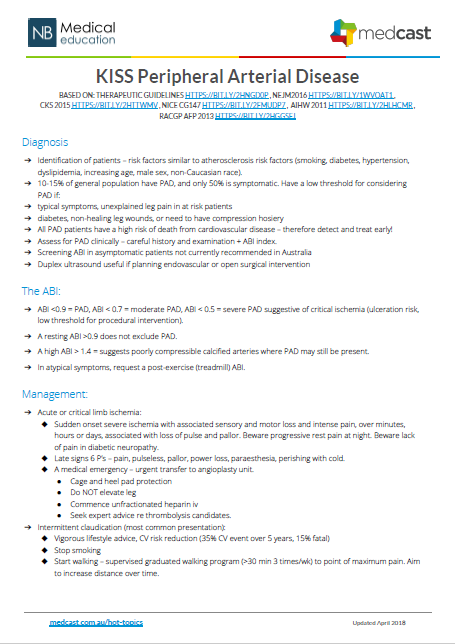 This KISS summary discusses the key diagnostic and management pillars of peripheral arterial disease including the latest evidence pharmacological options to improve symptoms and outcomes. Acne is a common and debilitating problem. Traditional treatment approaches leaning towards long term antibiotics are being challenged by rising antibiotics resistance. 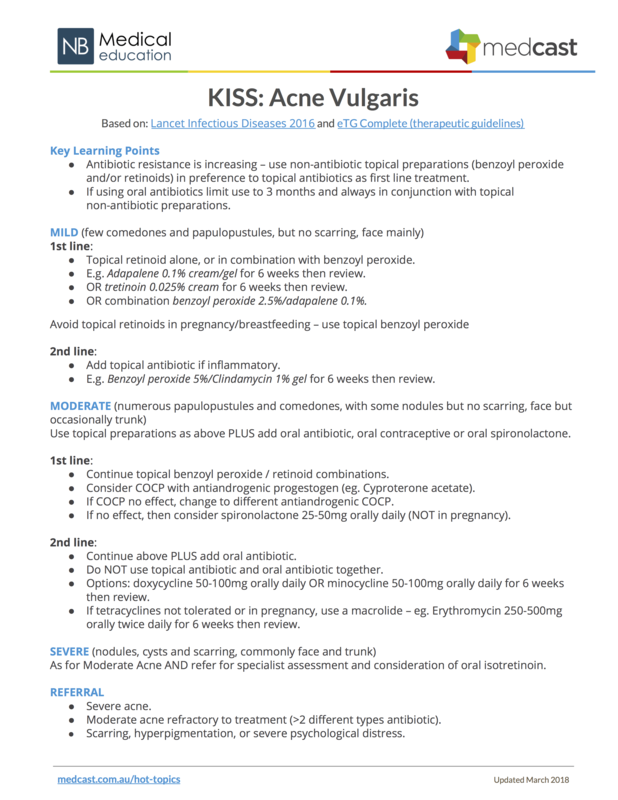 In this KISS, we present an updated, simple stepwise guideline, with practical tips that aim to minimise topical and oral antibiotic use. Neuropathic pain is a immensely debilitating but often poorly understood condition. In the past we have turned towards various neurotransmitter-modulating medications to treat what we thought was neuropathic pain. 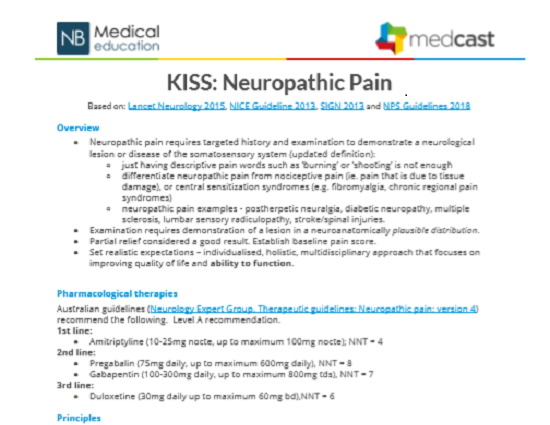 In this KISS, we review the latest clinical definition of neuropathic pain and provide updated medication guidelines for treatment. Ischaemic heart disease is a common and important cause of morbidity and mortality in Australia. Optimisation of therapy in stable angina is an important skill for all clinicians. In this KISS, we discuss updated pharmacological guidelines for treatment and secondary cardiovascular prevention. Urticaria is such a common problem, and there often seems to be little we can do. But there are a range of options. For example, how often do we consider using ranitidine... and if we wanted to use it, where does it fit into a graded approach to management? 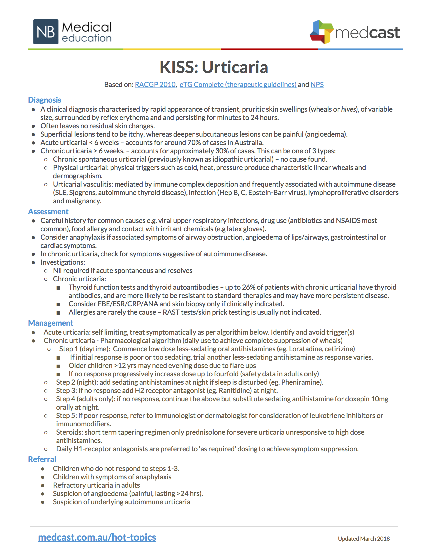 In this KISS, we review an evidence based approach to urticaria, looking at practical strategies for diagnosis and management. 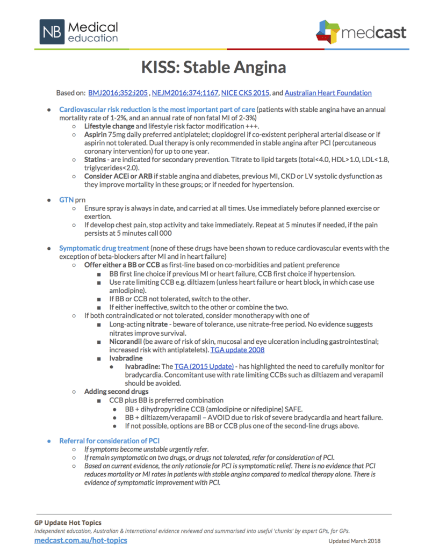 As part of the NBMedical/Medcast Hot Topics workshop series, we produce a range of KISS summaries. 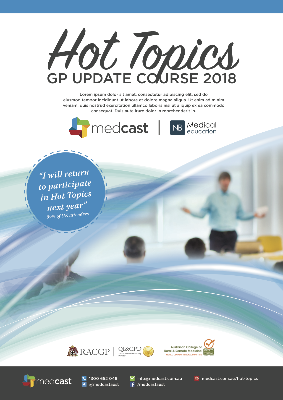 By attending the live workshop, you will receive the latest workbook of 150+ evidence based summaries, reviewed yearly and localised for Australia.